There has been a flurry of activity at the park site this past week. We are happy to say that Winged Victory has now returned home and mounted on the new base. There is still some cosmetic work to be done to the base and this is expected to be completed within a few days, also, flagpoles will be installed in time for Remembrance Day. The base is of Newfoundland granite and the larger unit weighted in at 25 tons. The lower granite slabs are inscribed with reference to the various war conflicts and the Act of Remembrance is etched into the larger stone. Work will now be able to proceed with the construction of the base for the Airmen’s Wall of Honour and the cenotaph plaza will be covered with granite stone (may not be completed this season). Landscaping will proceed as weather and time permits, however, planting may not occur until spring. Picking up the granite that will be base and pedestal for the mounting of the "Winged Victory"
Rev. Oake celebrated his 91st birthday on May 31, 2013. To assist us with fundraising and in commemoration of his birthday, he had planned to parachute from an aircraft over Gander at 9100 feet and hoped to raise at least $100.00 for each 100 feet. This endeavour was planned to occur over the past summer, but, unfortunately, coordination and readiness of appropriate aircraft and certified personnel could not be realized in time for the anticipated undertaking. These unforeseen circumstances has possibly delayed any action until next season. Throughout the past few months Rev. 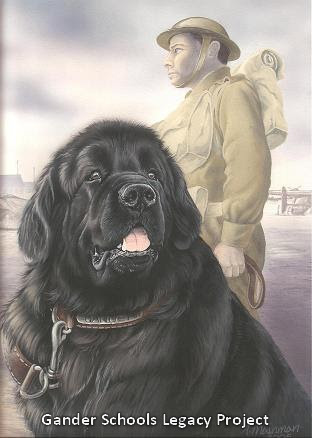 Oake has visited numerous businesses, organizations and individuals who have contributed generously to the new Gander Heritage Memorial Park. We cannot emphasize enough how grateful we are to have this gentleman representing us. His determination and hard work has been recognized by contributions of over $10,000 to date. To raise additional funds the Park Committee held a ticket sale during the summer months. Our sincere thanks to the following for donating the prizes, as follows: 1st Prize - Hand-hooked Wall Hanging of Sgt. Gander valued at $500 donated by Sandra Kelly; 2nd Prize-Handmade Quilt valued at $300 donated by Eileen Elms; 3rd Prize-Doll and Handmade Doll’s Clothes valued at $125 donated by Betty Burt; 4th Prize-Handmade Kitchen Décor valued at $100 donated by Maxine Smith. The draw took place at the Royal Canadian Legion on September 15th by our Honorary Patron, Rev. W. Oake and the winners were: 1st Prize - Gerald Noseworthy, 2nd Prize – Richard Rendell, 3rd Prize – Cynthia Pheifer and 4th Prize – Gerald Noseworthy. Our congratulations to the winners and our thanks to the committee for their great performance in ticket sales! We were so pleased to realize $1087.00 from the sale of these tickets.